Most infrared images render skies orange or reddish, depending on how you adjust the white balance setting. In order to make the sky look blue, we need to radically shift the color hues in the image. Unfortunately, most RAW editors (including ACR/Lightroom and Aperture) do not permit a global hue adjustment of the magnitude required to shift red to blue and vice-versa. One exception to this is Nikon’s Capture NX2, which can be used with good results on Nikon NEF images (more on this later). Set the Red output channel as shown. Set the Blue output channel as shown. Once you’ve done this adjustment, you can save the values as a preset to quickly apply later on other images. After swapping the channels, you may need to perform a hue/saturation adjustment to get the colors to your liking. 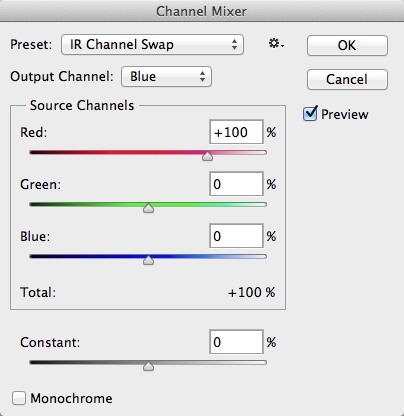 After channel-swapping, you may need to adjust hue to get the colors you want. Use the Hue/Saturation tool to correct colors in the channel-swapped image. Red-blue channel swap using Photoshop CS6 followed by Hue adjustment. 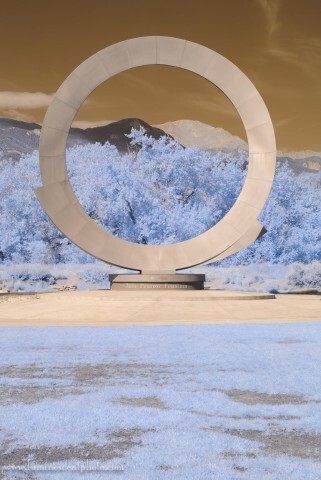 Invert both the a and b channel curves in Lab Color Mode to create a blue-sky effect. Once you’ve made this adjustment, you can go back to RGB color mode by choosing Image –> Mode –> RGB Color. Again, don’t flatten any layers if prompted to do so. If you don’t have an editor that allows for channel mixing, then an alternative adjustment is to perform a 180° Hue Shift. While not as powerful as channel-swapping, you can get results that are pretty close in most cases. You can perform a 180° hue shift with Photoshop Elements, Viveza 2, and Nikon’s Capture NX2. All of these applications work with TIFF and JPEG images. In the case of Capture NX2, you can work directly on Nikon NEF (RAW) files. 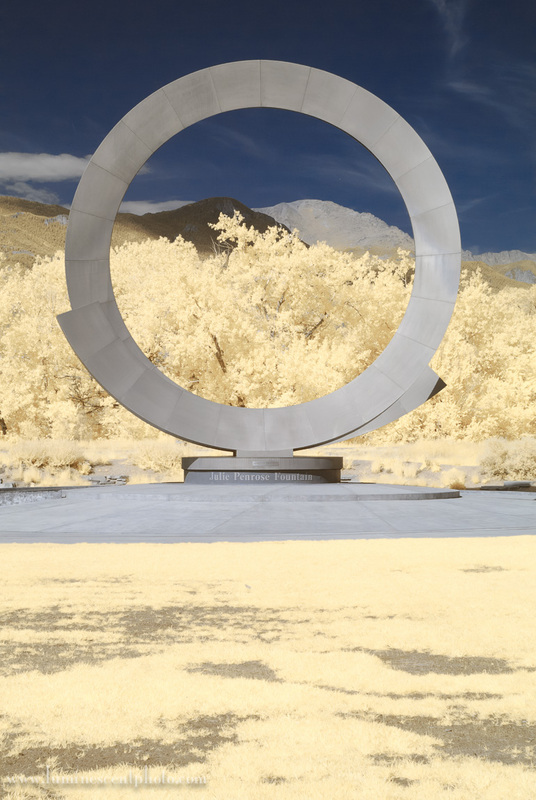 Open your image, and choose Enhance –> Adjust Color –> Adjust Hue/Saturation. Set the Hue slider to 180°. Then adjust saturation to your liking. You can use Photoshop Elements to perform a 180° Hue shift on your image and get a blue-sky effect. Nik Software’s Viveza 2 (Part of the Nik Collection by Google) has several interesting features, the most interesting of course is local adjustments via Control Points. However, you can also use Viveza 2 to perform global hue and saturation adjustments. You can also use Viveza 2 directly from Lightroom or Aperture if you don’t have Photoshop. Launch Viveza 2 and then set the global Hue Slider to 180°. 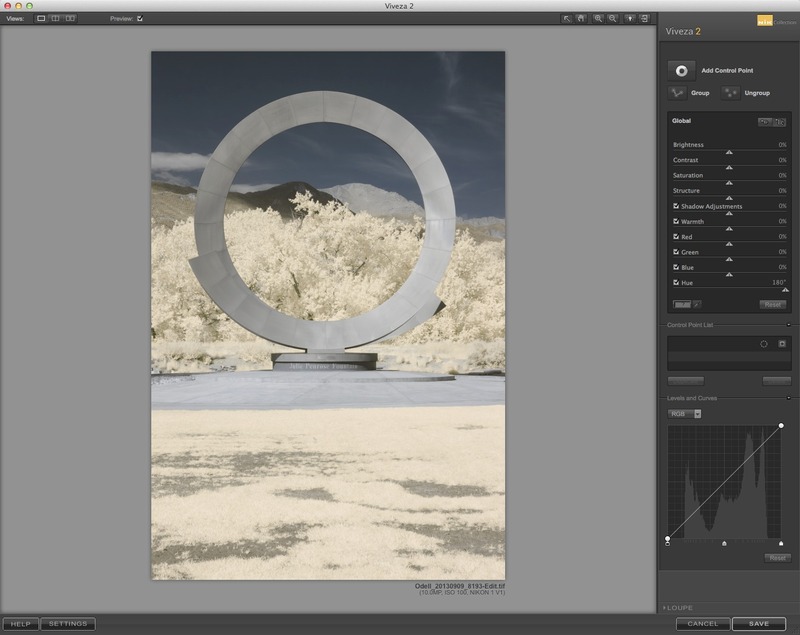 From there, you can adjust saturation and other parameters to fine-tune your image. 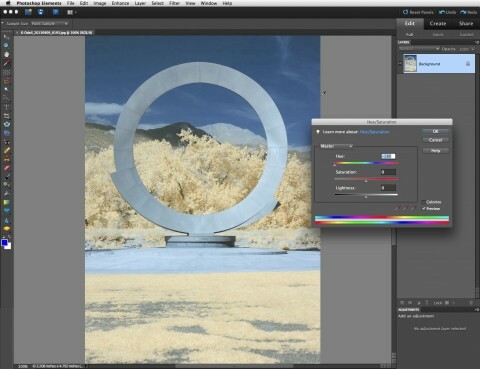 Viveza 2 can be used to perform hue and saturation adjustments, as well as other enhancements. If you shoot with a Nikon camera and capture NEF images, you can use Capture NX2 directly on your RAW files. You can also use Capture NX2 on TIFF/JPEG images exported from Lightroom or Aperture if you wish. 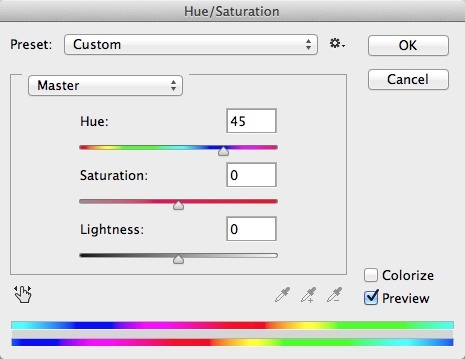 To perform the hue adjustment, you’ll need to add a LCH Editor Adjustment Step. 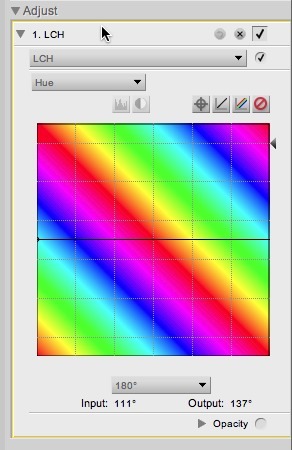 Then, choose “Hue” from the drop-down menu in the LCH Editor window. 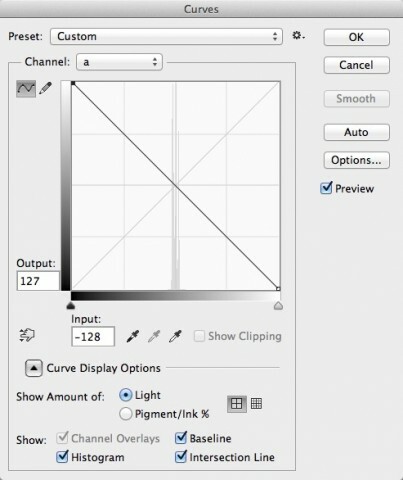 Set the Hue range to 180° and then drag the slider (triangle) up or down to get the effect. In Capture NX2, the LCH editor can be used to perform a 180° hue shift. Image adjusted in Capture NX2. At the end of the day, you can find lots of ways to be creative with your infrared images. The blue-sky effect works well when you want to have an image that combines realistic elements with surreal ones. There is no single correct method for creating this effect. Sometimes, you’ll find certain images work better with one technique than others. Keep exploring and enjoy the ride! How about a shout out for GIMP. Another fine and FREE program that does channel swapping! I have a couple of cameras that I converted myself for IR. Unfortunately, they do not allow for RAW mode. What can be done if the photos are .JPG? Thank you for your time and courtesy. You can still perform the same adjustments on JPEG images, Leslie. You just won’t have quite the same latitude making WB adjustments. Thank you for another great article on IR processing! These are really super helpful. Also, when I tried to do the channel swapping, my entire image changes from red to blue. How can I just have the sky and water turn blue and everything else be shown as white? Thanks for any help you can provide. You are correct; that is a typo on my part. Thanks for the catch. The Blue channel should be as in the screen shot. Thanks so much, I’ve been using Canon xt converted to 590 nm and several Pt & Shoots w various conversions. Really appreciate your advice on using Nik plug-ins, very helpful. Hi! Thanks for this tutorial. Is the Lab Channel swap method another way of inverting channels, or a complementary way of doing it? I find that the result I get with the Lab Channel swap method you described is totally different, overly blue. Thanks for the comment! the LAB method is simply an alternative method to creating the channel swap, and sometimes the effect is slightly different. You can experiment with which looks better for any particular image.